What a difference a week makes! I am very pleased to report that many of the concerns so many raised at the hearing and in other venues about HB 3074 have been met and it is worthy of support as a true incremental improvement over existing law. 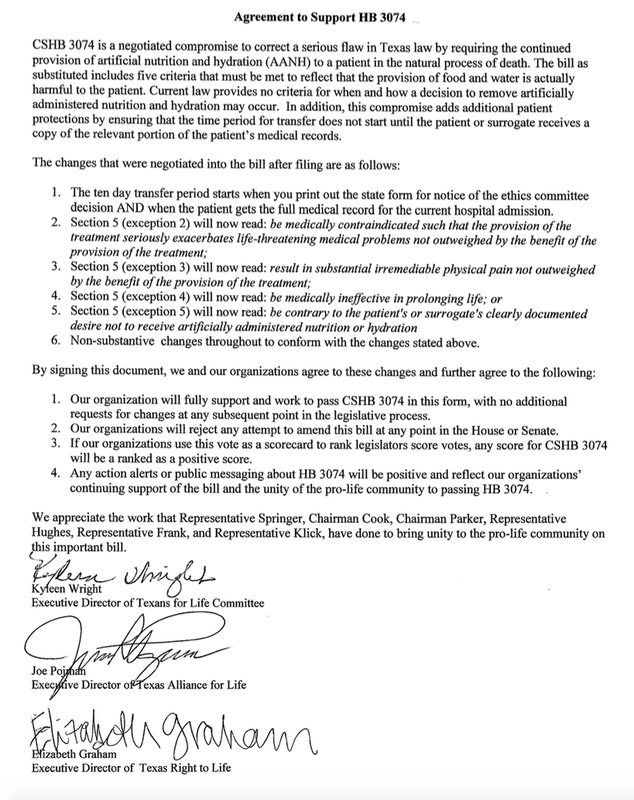 The new Substitute Bill, which is not yet available online, can be supported as an incremental improvement to the Texas Advanced Directives Act ("TADA"). Let’s jump right in and I will try to keep this as short as possible while still giving you bill text and substance to analyze. This is my own analysis and viewpoint, but I am very excited about what has happened here and I'm so grateful for those who made this happen. (5) be contrary to the patient's clearly stated desire not to receive artificially administered nutrition or hydration. 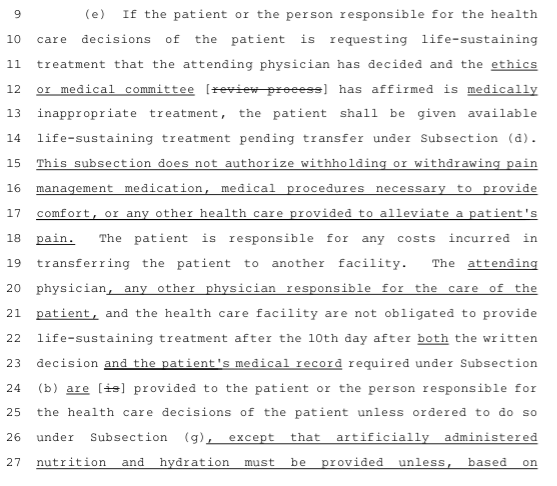 Those of us who opposed the original (and the first Committee Substitute) bills were concerned about this very broad, subjective language that allows for “quality of life" determinations to be the basis of withdrawing care. That is what is called “passive euthanasia” and it happens here in Texas. I described this in my prior post on HB 3074. In addition to Representative Tan Parker, others who helped Representative Springer are to be thanked: Representative Bryan Hughes (R-Mineola) who serves as the Pro-Life Whip in the Texas House, Representative James Frank (R-Wichita Falls), Representative Dan Huberty (R-Houston/Kingwood), Representative Stephanie Klick (R-Fort Worth), and Representative Richard Raymond (D-Laredo). We are very grateful for their diligence and time spent to facilitate changes to HB 3074. Let me address what the revised wording accomplishes in my own view. With regard to the second exception, "be medically contraindicated such that the provision of the treatment seriously exacerbates life-threatening medical problems not outweighed by the benefit of the provision of the treatment" is much more narrow and precise than "seriously exacerbate other major medical problems..." Withdrawing AANH how has to be in those rare circumstances, for example, where a person's body simply cannot assimilate the AANH any longer. That does happen. The third exception is probably the most important change. 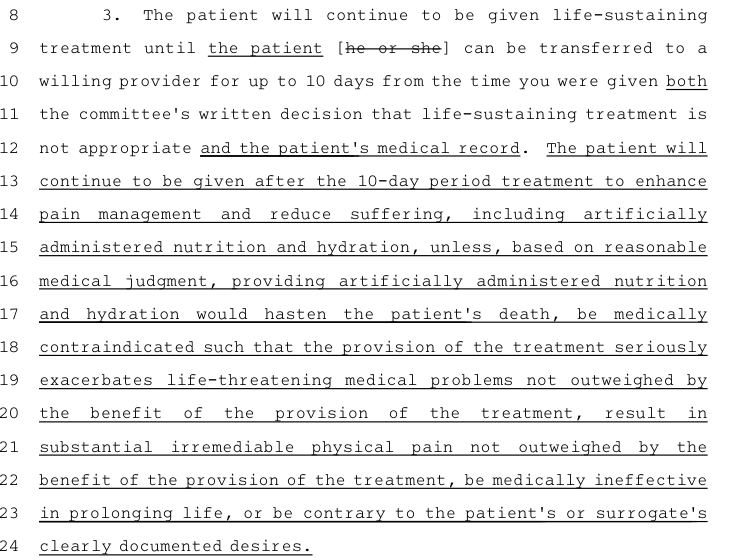 The bill has gone from allowing the withdrawal of AANH when it the doctor believed it caused "discomfort" or "suffering" (which was not necessarily limited to only physical suffering since physical did not precede suffering, but only preceded pain, thereby opening the door to "quality of life" determinations) to requiring "substantial irremediable physical pain..."
The fourth exception was also problematic. Originally, it read "be medically ineffective" but that was open to many interpretations especially for a situation where, perhaps, the patient can assimilate food, but is otherwise, for example, dying of a terminal condition or is in a coma. A doctor could argue that the AANH is not medically effective - at reversing the underlying condition. This, too, could open the door for "quality of life" judgments. Now the language is very clear that it must be "medically ineffective in prolonging life." Of course, the withdrawal of AANH will almost always terminate life or hasten death faster even in someone who is otherwise afflicted with some serious illness or injury. This provides clarity. I like very much that the 10-day rush to find another facility does not begin until the medical records are provided. In the past, it has been difficult to get medical records in the short time given to transfer. I also like that this paragraph indicates that if a willing provider is found that treatment will continue past the 10 days. Under current law, there is a sparse process, medical records are hard to obtain, and there are no procedures for protecting a patient from the withdrawal of AANH or other life-sustaining treatments. It can be done for any reason, including "quality of life" reasons. While there was the potential for losing immunity under current law, there was not much in the way of protection that was afforded a patient that lent itself to being enforced. Likewise, if the original exceptions had remained and had become law, they were open to so many interpretations that one could never really say that the procedure was not followed and the doctor or hospital could never lose immunity. Thus, there would be no enforcement mechanism. Now, with these narrowly drawn exceptions that are not so open to just any interpretation and a deadline that does not start to run until medical records are obtained as part of the process under .046, I believe that there is an enforcement mechanism through a provision already in the law. I confess that it is unclear to me, however, if non-compliance with Section 166.046 can be challenged during the process to request more time, if that could be a means to obtain more time, or if that would have to be a separately filed (and, hopefully, simultaneous) lawsuit. Sometimes the procedural aspects of new law take time to work out when they are not addressed in the law. Hopefully, this will not have to be used often, but I am glad that it is there just in case. There must always be checks and balances. Either way, now there is a process to limit cases where AANH and other life-sustaining treatment are withdrawn against a patient's wishes. 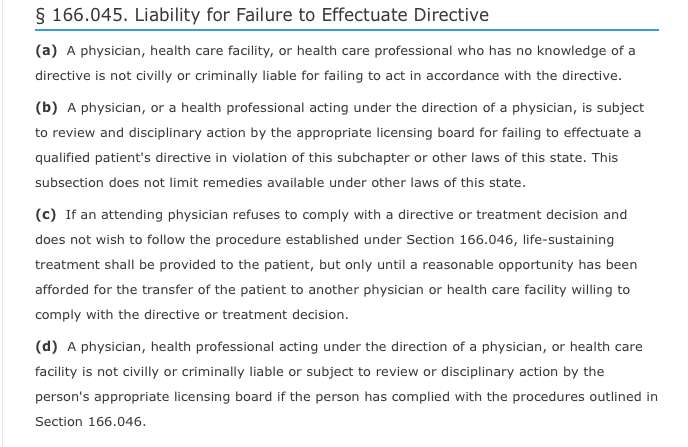 That combined with existing law mean a doctor and/or health care facility can be civilly and criminally liable for doing so if they do not follow the much more narrowly tailored process, including narrowly worded exceptions allowing for that withdrawal. That is, if this bill passes and becomes law. 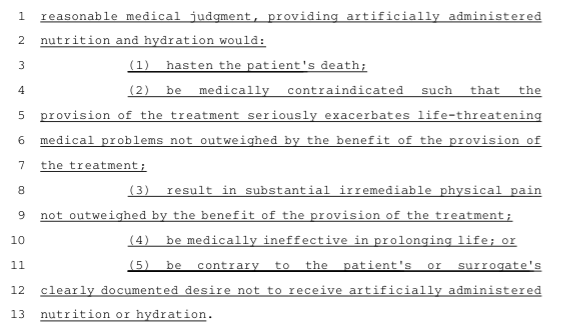 While Texas Right to Life will continue to pursue patient protections and larger reforms to the Texas Advance Directives Act, limiting the circumstances in which food and water can be withdrawn is progress. Representative Springer considered our decade of experience as the only organization that helps patients and families facing futile care judgments; he heard our concerns and those of many others about the pitfalls of broad language, accepted our changes, and brought aboard the other stakeholders. I have said before that Texas Right to Life is the only pro-life group that works to help patients navigate this process and has the most experience in the trenches. They know how the process works in reality and are in the best position to gauge what is real reform and how it would most likely be used versus what is merely aspirational. UPDATE: The bill passed out of the State Affairs Committee this evening. It will now have to be brought up for a floor vote in the House. Of course, then it has to find its way to the Senate, be passed there, etc. It has a long ways to go. There are still many problems with TADA that are not addressed by this bill, but it was always intended to be limited in its scope. I have detailed these problems in my prior posts and they were discussed in much of the testimony at the hearing on this bill. But I am so very happy to say that there is finally something that we can support as truly incremental improvement to TADA. This is an important step and I hope just the first of many, many more. One final note, I really do think that all of you that testified against, called, and otherwise helped get the word out made a difference. It is no secret that these negotiations were hard. This is a very, very difficult issue. But some very big progress was made and that was no accident. So, thank you.